A Follow Spot: "Diviners" on the Radio Tomorrow! "Diviners" on the Radio Tomorrow! Continuing on this week's "Diviners" theme (since it opens tomorrow night at Heartland Theatre), director Chris Connelly and actors John Bowen (who plays lapsed preacher C.C. Showers) and George Freeman (who plays Ferris Layman, the father of the boy who has divining skills) will appear live on the radio tomorrow at Bloomington-Normal's WJBC to talk about the play. Connelly, Bowen and Freeman will be talking to mid-morning host Patti Penn on the air at WJBC from approximately 9 to 9:25 am. 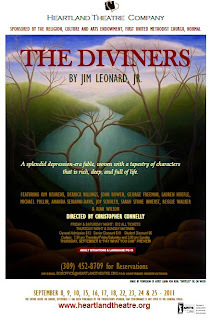 I hear through the grapevine that they may be offering a pair of tickets to "The Diviners," so you may want to listen in (and possibly call in) if you're looking for tickets. WJBC is on the air at 1230 AM and 93.7 FM, or you can listen online here. Enjoyed your PJStar preview/review, too! Also, I've seen the fabulous set, and am all the more eager to see actors on it now! I also missed the Diviners' folks on the radio, but I bet they were good. The show is REALLY good. I saw it last night. And, yes, the set is super nifty. ISU Offers Inside Scoop With "Theatre Encounter"